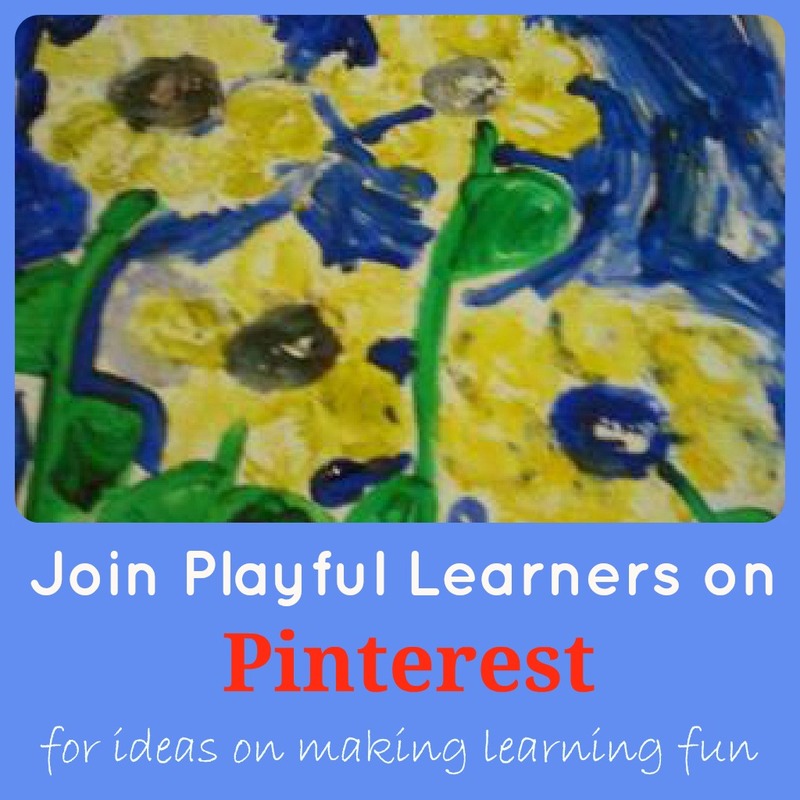 Do you have a toddler who is fascinated by play dough? 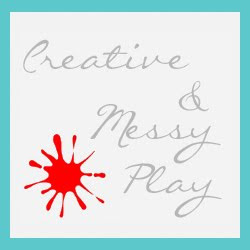 Create a small world experience for your little one and watch as their imagination takes them away, there is really no end to what play dough can be used for . 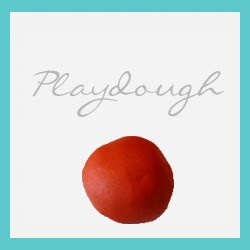 Every week we make a new batch of play dough (I use our simple play dough recipe) and I have often struggled to move the boys away from the idea of using it for rollers and cutters. This week was to be different, after raiding the house for materials I decided to add some stones and broccoli to create a scene and some new Schleich Mini Dinosaurs we had been sent this week to review. The boys first reaction was priceless I wish I had a video camera to hand. They could not wait to jump up to the table ans get stick in. 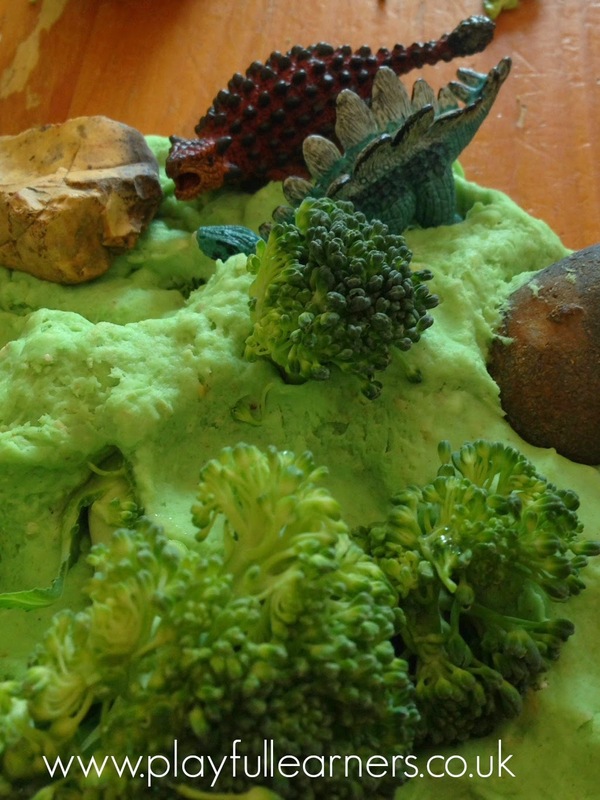 They divided the play dough up with a little help and instantly started adding the pebbles and broccoli. 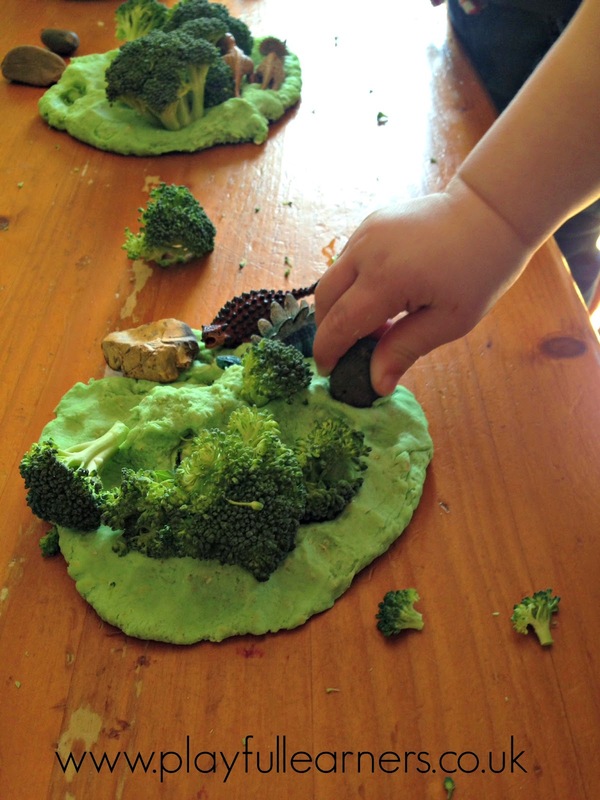 They had great fun pretending the dinosaur's were eating the trees and making dino prints on the grass/play dough. 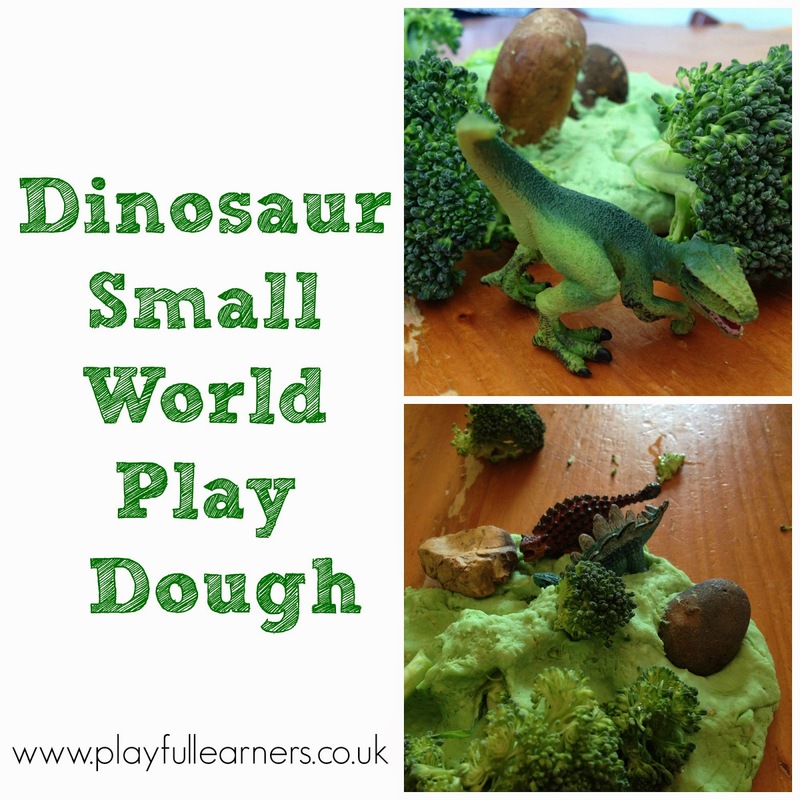 Do you have a favourite play dough small world idea? Today the children have been finding out more about Saint Patrick's day and the traditions that surround it. 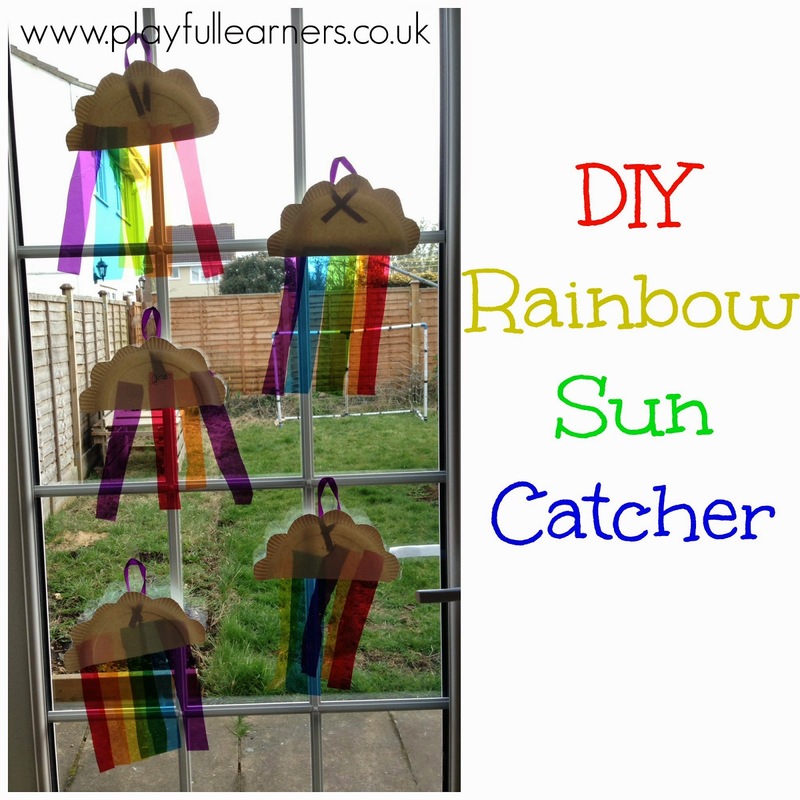 One of the activities we did today was to make rainbow sum catchers. Our windows have looked bare since we moved house and had to take down the previous displays so I've been keen to fill them again. 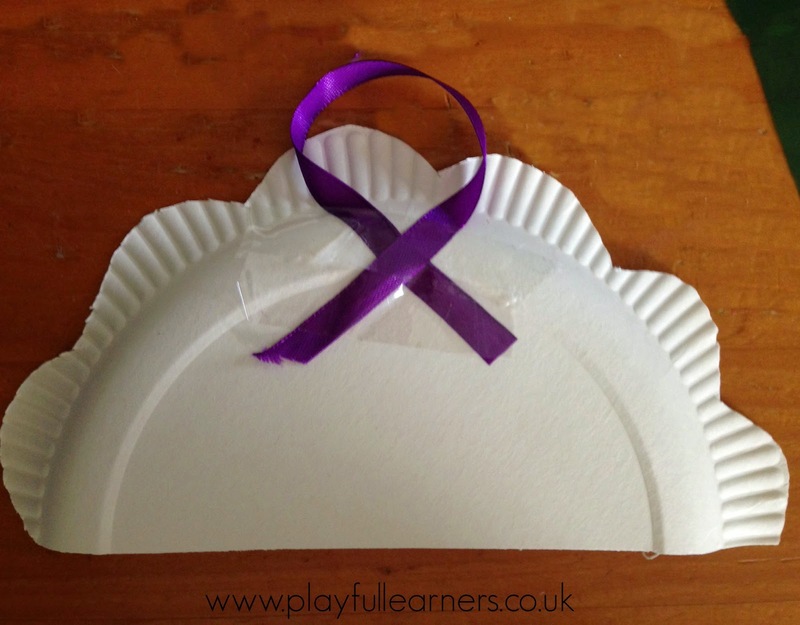 Step 1- Cut a paper plate in half then use the scissors the create a clouds puffy effect around the edge. As pictured above. 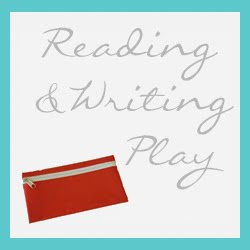 Step 2- Use a piece of ribbon roughly 20 cm long, fold over to make a lop and fix onto the back using tape. 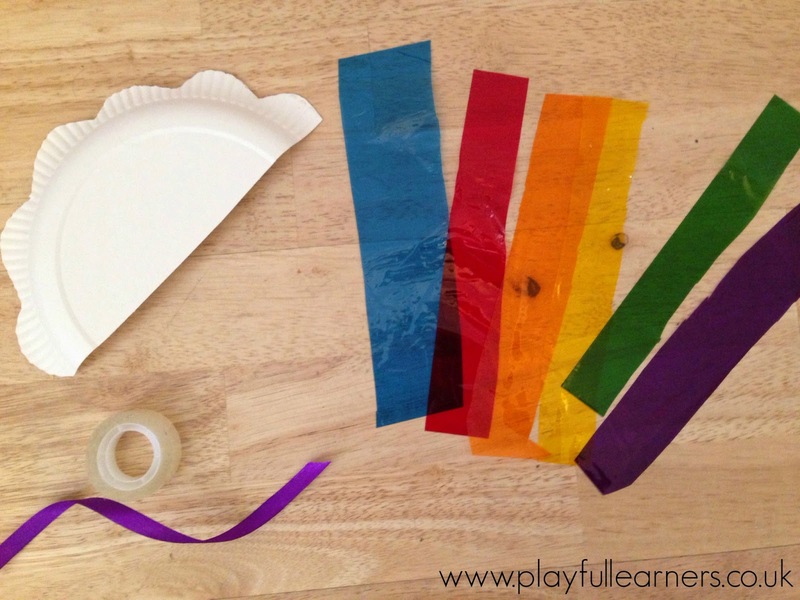 Step 3- Cut the cellophane into equal lengths, one inch thick. 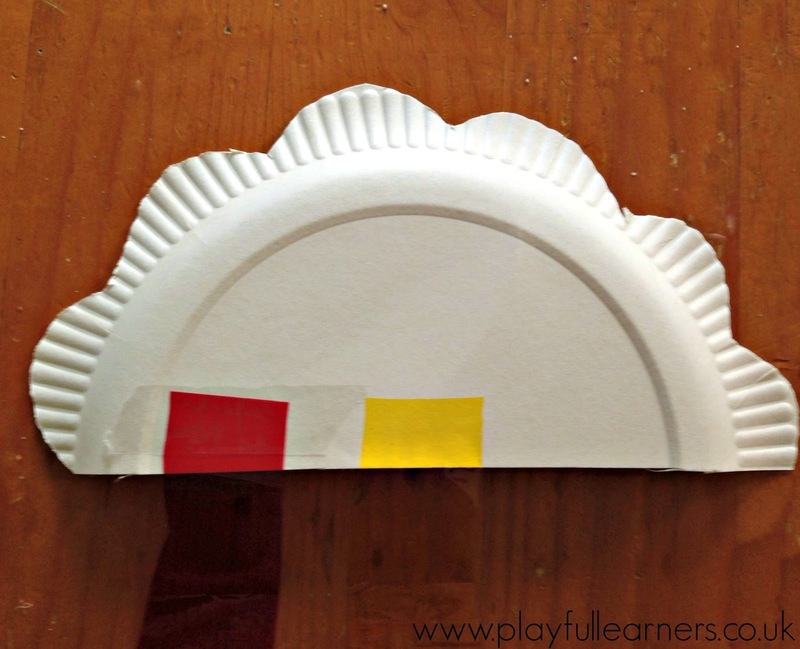 This is the perfect time to discuss the different colours of the rainbow and even sing the song as you stick down the rainbow colours onto your cloud. 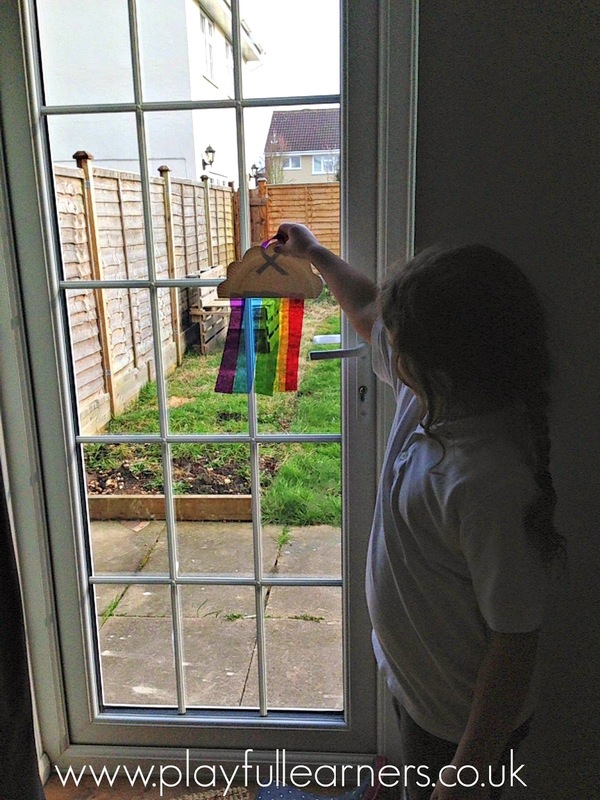 That's it, a lovely simple but very effective stain glass rainbow for your window. 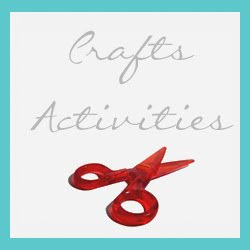 If you have any (we seem to have lost ours ) you could also add cotton wool balls to your cloud. The children loved seeing the end effect and putting them up against their window. 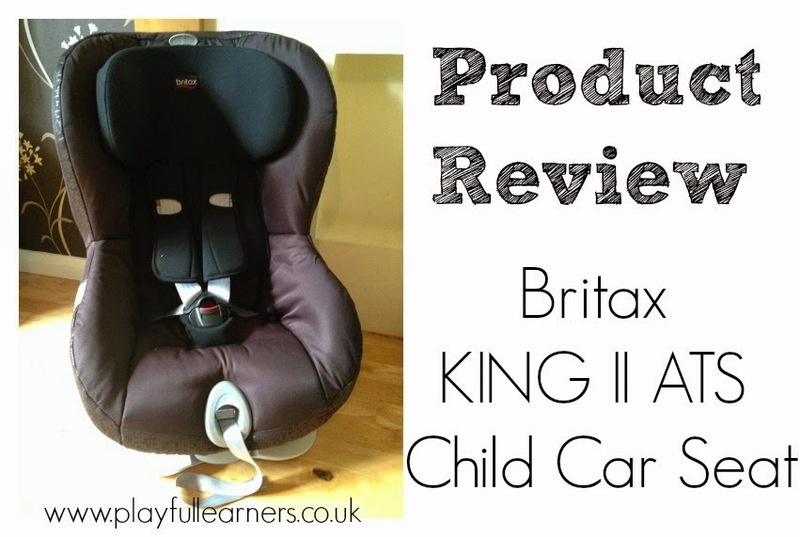 Recently we were asked to review The King 11 ATS for Britax, This could not have come at a better time for us as Tinnie (now 2 years old) has just grown out of his car seat. The newly launched Group 1 belted seat the 'KING II ATS', is designed to help parents travel with greater confidence and keep their eyes on the road ahead. an intelligent light and sound indicator that helps parents to find the correct harness tension before they set off in the car. a unique Active Tensioning System (ATS), which automatically adjusts and retracts the slack in the child’s harness to keep tension just right throughout the journey. 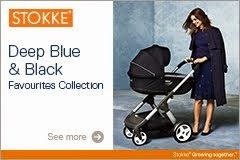 features an intelligent warning system that alerts parents with a sound and light indicator if the harness is undone or no longer at the correct tension because the automatic retraction system might be at the end of its working range and cannot compensate any additional slack in the harness. When we first received the car seat I was pleasantly surprised at the quality of this car seat. This is our first Britax product and I'm starting to think we have seriously missed out over the years. The car seat featured thick padding on the side wings to protect tinnies head and making for a great pillow during long car journeys. The shoulder straps feature great ribbed chest padding for comfort to stop little ones from wanting wriggle free and more importantly reducing movement during impact. 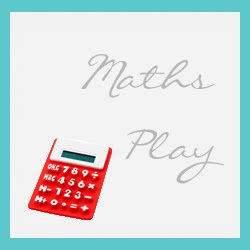 The King 11 ATs also has features to make parents life a lot easier. The car seat cover can be removed with out removing the straps keeping them fixed in the right position and tension. I would normally have to nag hubby to take the cover off and fit it back on for me but this idea has made it a whole lot easier. The car seat also has an easy adjustable headrest, no more taking the whole seat about to move the straps up a slot, nope the King 11 ATS has an easy single hand adjustment head rest. Over all we love the new car seat and all of its new features. 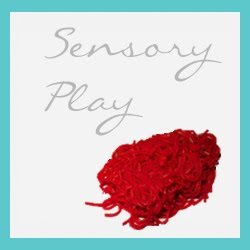 We have found it is important to ensure your child is sitting still and the straps are in the right position before tightening otherwise it will remain loose. Tinnie loves the lights and sounds the car seat makes and this helps to stop the fuss of getting him in the car altogether. 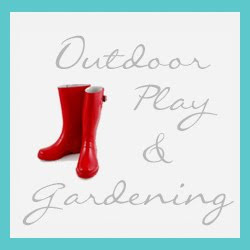 The KING II ATS is now available exclusively from Mothercare £180 in Black Thunder.